A couple of weeks ago I was excited to learn that I'd won an online contest. 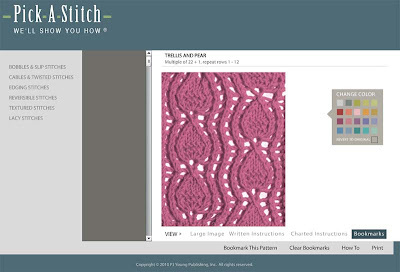 The prize was the CD "Pick-A-Stitch" from the PJ Young Publishing Company. The CD contains 130 stitch patterns in the categories of: bobbles and slip stitches, cables and twisted stitches, edging stitches, reversible stitches, textured stitches and lacy stitches and switching from one to another only requires a simple click of the mouse. It's an excellent little program and easy to use. 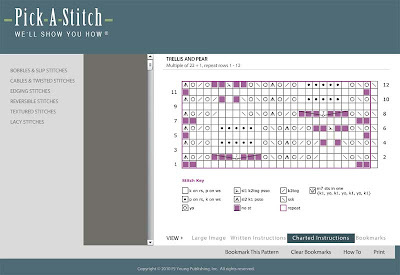 If you've got a computer, you've got a stitch dictionary. 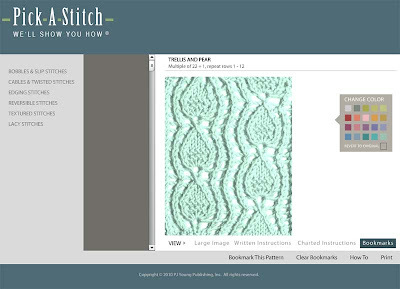 I'd love to see it expand someday... to include hundreds of patterns and more color options. I'd be surprised if this wasn't the beginning of more CDs to come. Maybe apps for your phone, too? Thanks PJ Young for my cool prize! ooh, I'm jealous. That's a very cool product. Have fun with it. Watermelon Socks - F. O.